Jaja Anucha Wachuku (1918 - 1996), was a Pan-Africanist; and a distinguished Nigerian statesman, lawyer, politician, diplomat and humanitarian. He was the first Speaker of the Nigerian House of Representatives, as well as first Nigerian Ambassador and Permanent Representative to the United Nations. He was also the first Nigerian Minister of Foreign Affairs. Wachuku was the First African Laureate in Oratory of the Trinity College, Dublin, Ireland. He matriculated at Trinity College in 1939, and was, in 1941, elected Executve Member of the College Historical Society. Wachuku represented University of Dublin during the 1943 Inter-University Debate held at University of Durham. He was called to the Irish bar association - Kings Inn - in November 1944. He was fully involved in Nigeria's constitutional conferences and struggle for independence from Great Britain. Wachuku practised law in Dublin, Ireland - for three years - before returning to Nigeria in 1947. He graduated B.A. Legal Science and was LL.B Prizeman in Roman Law, Constitutional Law and Criminal Law. He was also a Research Fellow at the Department of International Law, Trinity College, Dublin - with the topic: "The Juristic Status of Protectorates in International Law." From 1947 to 1996, Wachuku served as Barrister and Solicitor of The Supreme Court of Nigeria. He also practised at the West African Court of Appeal (WACA). While in Dublin, Wachuku was an Executive Member of the Student Christian Movement (SCM). He lectured on various subjects during the Student Christian Movement Summer Schools in Great Britain and Ireland; and delivered the last seven of such Diplomacy lectures at Swanwick, Hampshire - on the subject: "Africa in the Post-War World." From 1939 to 1943, Jaja Wachuku was Secretary of the Association of Students of African Descent (ASAD) in Ireland; and in 1944, he was elected President of the Association. During 1945, he represented ASAD at the fifth Pan-African Congress held in Manchester, England. From 1943 to 1945, Wachuku was founder, organizer and secretary of the Dublin International Club. He was president of the Club from 1945 to 1947 and resigned when he returned to Nigeria in 1947 to fight for an end to colonial rule and independence of Nigeria from Great Britain. In 1947 also, Wachuku was, for six weeks, Legal and Constitutional Adviser to the National Council of Nigeria and the Cameroons (NCNC) Pan-Nigeria Delegation that went to London to press for constitutional reforms in Nigeria. He was awarded LL.D (Honoris Causa) by Trinity College, Dublin. "Enclosed are a few clippings from West Africa. You will no doubt remember Jaja Wachuku who was a delegate to the Fifth Pan-African Congress. He has recently started a Pan-African Party in Nigeria to spread the ideas of which you are the worthy father...."
Interestingly, Wachuku was co-founder and original shareholder, with Nnamdi Azikiwe, of the African Continental Bank (ACB). And was the First Regional Director of the bank from 1948 to 1952. As ACB Director, he facilitated the opening of branches in Aba, Calabar, Port Harcourt and Enugu. Jaja Wachuku started his political career from the grassroots. In 1948, he was first nominated village councillor and later to the Nsulu Group Council. From 1949 to 1952, he was a Member of the Ngwa Native Authority, Okpuala Ngwa. In 1951, he entered regional politics and was elected Second Member for Aba Division in the Eastern Nigeria House of Assembly. From 1952 to 1953, Wachuku was elected Deputy Leader of the NCNC and Chairman of the Paliamentary Party when there was crisis in Nigeria's Eastern Region - resulting in the desolution of the Eastern House of Assembly. From 1952 to 1953, he was Chairman of the Eastern Regional Scholarship Board and Member of the Finance Committee in the House of Representatives OF Nigeria. Wachuku went to the 1953 Constitutional Conference in London as Alternate Delegate and Adviser to the Nigerian Independence Party (NIP) - a break-away faction that was formed following the NCNC crisis of 1953. In 1954, Wachuku lost the Eastern Regional election and ceased to be a member of the House of Representatives. Later on in 1954, when the principle of direct election to the House of Representatives was introduced, he was re-elected first member for the Aba Division in the House of Representatives; as well as member of United Nigeria Independence Party (UNIP) - amalgamation of the Nigerian Independence Party and another party. In 1957, Wachuku became Deputy Leader of opposition when he joined the NCNC. From 1957 to 1959, he was a Board member of the Electricity Corporation of Nigeria (ECN). Also, in 1957, for the following three years, he was appointed member of the Local Education Authority and Chairman of the Board of Education in the Eastern Region of Nigeria. During the same period, Wachuku was also Chairman of Aba Divisional Committee of the NCNC. Accordingly, in 1957, Jaja Wachuku was the Leader of the Nigerian Federation Delegation to the Commonwealth Parliamentary Association Meeting held in India, Pakistan and Ceylon, now Sri Lanka. He also represented Nigeria in Liberia during the opening of the New Parliament Building in Monrovia. 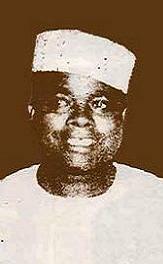 From 1958 to 1959, Wachuku was Chairman of the Business Committee in the House of Representatives of NIgeria. He was also a member of the Parliamentary Committee on the Nigerianization of the Federal Civil Service. He wrote the Committee's Report assisted by Mr. Michael O. Ani. In 1959, Wachuku was re-elected into the House of Representatives from Aba Division; and was, subsequently, elected the first indigenous Speaker of the Nigerian House of Representatives. From 1959 to 1960, Wachuku was the first indigenous Speaker of the House of Representatives of Nigeria. He replaced Sir Frederick Metcalfe of Great Britain. 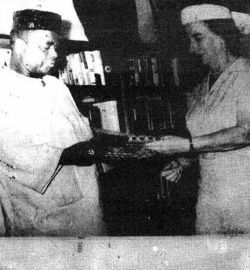 Notably, as First Speaker of the House, Wachuku received Nigeria's Instrument of Independence - also known as Freedom Charter, on October 1, 1960 from Princess Alexandra of Kent - HM The Queen of United Kingdom's representative at the Nigerian Independence ceremonies. On a 1960 United States tour as the House of Representatives Speaker, Jaja Wachuku was honoured and presented with the City of Philadelphia, Pennsylvania Blue Seal and Key to the City of Atlanta, Georgia. Notably, It was during this period and during his years as First Nigerian Foreign Affairs Minister that Wachuku forged the reputed friendship that he had with three Presidents of the United States: Dwight D. Eisenhower, John F. Kennedy and Lyndon B. Johnson. He was also good friends with Martin Luther King, Jr., Marian Anderson, Nelson Aldrich Rockefeller, Henry Ford II and so many other Americans. And also Israel's Golda Meir; as well as numerous leaders and people around the world. Following a cabinet reshuffle at Nigeria's independence, Wachuku was appointed Minister of Economic Development and Member of the First Nigerian Delegation on the admission of Nigeria to the United Nations. On the eve of his departure from New York, the Prime Minister Sir Abubakar Tafawa Balewa invited Wachuku to his hotel suite and told him that he was leaving him behind as Leader of the Delegation and Ambassador plus Permanent Representative of Nigeria to the United Nations. Jaja Wachuku protested to Prime Minister Balewa - saying that he did not join the Delegation with the intention of staying in New York, and that he told his wife, Rhoda, that he would be away for only one week. Prime Minister Balewa replied: "Never mind, I will tell her when I arrive Lagos." At the United Nations, he soon stood out in excellence and visionary, selfless service to his country Nigeria and the rest of humankind. It was during this period that Time commendably quoted Wachuku as saying - from the rostrum of the United Nations General Assembly: "I am losing confidence in the great powers. They are climbing from the pedestal of greatness to the pedestal of insanity. We expect leadership from them; they give us destruction. We expect wisdom from them; they give us lack of knowledge...." He was lambasting the Eastern and Western Blocs for not ending their differences and quarrels. Under Wachuku's leadership at the United Nations, both the Nigerian Army and the Nigerian Police Force made their debut in International Peacekeeping - under the auspices of the World Organization. During his time at the United Nations, Nigeria's Major-General Johnson Thomas Umunnakwe Aguiyi Ironsi was appointed Commander of the United Nations Peacekeeping Force in the Congo. Also, the first Nigerian Permanent Secretary, Mr. Francis Nwokedi was retained by the United Nations to help in the reorganization of the Civil Service in the Congo. Wachuku also secured the appointment of the first African Under Secretary-General of the United Nations - Nigeria's Mr. Amachree. From 1961 to 1965, Wachuku was the First Nigerian Minister of Foreign Affairs and Commonwealth Relations, later called External Affairs. On July 14, 1962, he was decorated with the insignia of the "Commander of the Order of the Niger Republic" in recognition of "services to the People of the Republic of Niger" by President Hamani Diori. As Foreign Affairs Minister, Jaja Wachuku organised the Afro/Asian group of States and worked to get Liberia voted into the United Nations Security Council, and Ethiopia into the Economic and Social Council. He also worked towards the amendment of the United Nations Charter - increasing the Security Council from eleven to fifteen - taking into account African nations. "The Nigerians, whatever their tribe, are a very strong, very assertive group. Foreign Minister Jaja Wachuku was a surprise for many American diplomats because he considered himself as having a status equivalent to the British, French, German, or Russian Ministers. Wachuku demanded that much attention and respect. The Nigerians were, and have been, very independent. Senior U.S. echelons weren't used to dealing with Africans as assertive and as strong minded as the Nigerians were. I found this nice because the Nigerians were absolutely always open with you, and would hit you over the head with whatever the problem was. They were entitled to respect and helped gain it for Africans. Ambassador Matthews was not the kind of person to go in and tell Prime Minister Balewa or Foreign Minister Jaja Wachuku how to do things...."
Jaja Wachuku as Foreign Affairs Minister of Nigeria preferred quiet consultation, especially with the two major Anglo-American powers: Great Britain and the United States - in search of solutions to continental and international problems. For example, there was a lot of hue and cry as a result of the Rivonia trial in South Africa in 1963 following the arrest of Walter Sisulu, Govan Mbeki, Denis Goldberg, Raymond Mhlaba, Andrew Mlangeni, Lionel Bernstein and others. They and Nelson Mandela, who was serving term on his 1962 conviction, were charged with "sabotage and... conspiracy to overthrow the Government by revolution and by assisting an armed invasion of South Africa by foreign troops." These charges were treasonable and carried the death penalty. 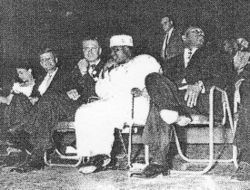 Jaja Wachuku quitely invited Lord Head, the British High Commissioner in Lagos and also United States' Ambassador Joseph Palmer II - and strongly urged them to intercede with their governments to prevail on the apartheid regime in South Africa - not to impose the dealth penalty on Nelson Mandela and others. 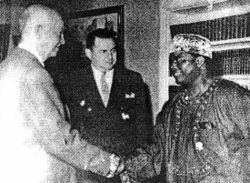 Wachuku employed the same quiet diplomacy on the matter with U.S. Secretary of State Dean Rusk and British Foreign Secretary Lord Home. Subsequently, Lionel Bernstein was acquitted and Nelson Mandela and the rest were given life imprisonment terms. Jaja Wachuku, like Hegel's historical individual, had the capacity to stand outside the confines of his time, place and intuiting history. He sought his vindication in historical reality. The Right Honourable Prime Minister Sir Abubakar Tafawa Balewa recognized and appreciated Wachuku's outstanding essence; and used to tell him that he was ten or more years ahead of his Government cabinet colleagues. Wachuku's uncanny historical intuition was evident from the start when, in 1947, he proclaimed Lagos an All-Nigerian city - long before that city became a federal territory. Wachuku also foresaw the danger of recognizing military coup as a way to change government: In Ethiopia, he strongly refused to accord recognition to the Nicolas Grunitzky Government in Togo after the January 13, 1963 first coup in that country. Jaja Wachuku believed that if that first African coup by the Togolese army was recogonized as a way to change government, then, coup making would spread in Africa. In Addis Ababa, during the Inaugural Conference of the Organization of African Unity [OAU], Emperor Haile Selassie sat Wachuku down in the presence of Prime Minister Balewa and begged Balewa to plead with his "Foreign Minister Jaja Wachuku" to accept that the Togolese Government be admitted to take part in that first OAU Conference. Wachuku jokingly reminded Emperor Haile Selassie and Prime Minister Balewa that he was only number three in the Nigerian Government, and that coup plotters go for numbers one and two - President or Head of State and Prime Minister. Jaja Wachuku added that by the time coup makers got to number three, he would be resting in his village. At the end, Wachuku refused to change his diplomatic position of not allowing Togo to participate because the Togolese Government came to power by coup. Therefore, Togo became the only independent African country that was not represented at the Inaugural Conference of the OAU. History has already told us whether Wachuku was right or wrong. Even Kwame Nkrumah who was one of the most vocal supporters of the Togolese Government of coup makers, later fell victim of the coup contagion. As for Jaja Wachuku, he had resigned from the Nigerian Parliament and Government at mid-day of January 14, 1966 - twelve hours before the first Nigerian military coup of January 15, 1966 led by Major Chukwuma Kaduna Nzeogwu. "Karl Marx must have had Togo in mind when he wrote in The Eighteenth Brumaire of Louis Napoleon, "Hegel says somewhere that all great events and personalities in world history reappear in one fashion or another. He forgot to add: the first time as tragedy, the second as farce". In 1963, when President Sylvanus Olympio was assassinated, Jaja Wachuku, the Nigerian Foreign Minister in condemning the action added that for security reasons, Nigerian boundary was the Togo-Ghana boundary. He was roundly condemned. Looks like he was just speaking forty years out of turn. He would be pleased to know that Nigeria had caught up with him. And that should also be a lesson to those who think that Nigerian foreign policy started and ended up with them." "Continuing interest among the black intelligentia in African culture was signalled by the creation of the American Society of African Culture (AMSAC) in 1956, which restricted membership to persons of African descent... Its third annual conference, in Philadelphia in 1960, devoted itself to the discussion of `African Unities and Pan-Africanism', and can be regarded as an event in the history of the movement. Some of those present had strong links with the Pan-Africanist past, notably Rayford W. Logan, who had played an important part in the era of Pan-African congresses after the First World War; Jean Price-Mars, Haitian diplomat, philosopher of négritude, and President of the Société Africaine de Culture in Paris; and Jaja Wachuku, who had been at the 1945 Pan-African Congress, and who was in 1960 foreign Minister of Nigeria...."
Subsequently, from 1965 to mid-day January 14, 1966, Wachuku was Nigeria's Minister of Aviation. With most of the aviation laws in Nigeria bearing his signature, Wachuku initiated training programmes for Nigeria's first crop of Flight and Ground Officers. The Aviation Training Centre, Zaria was established during his tenure. His visionary and upright zeal, however, did not go well with his party, the NCNC - a party which saw Mr. Blankson, Nigerian Airways Board Chairman and also the party's Central Working Committee Chairman, as representing NCNC's interest in the spoils system. from the Chairmanship of the Nigerian Airways Board, Wachuku fired and removed Blankson who felt himself beyond ministerial control. His party, the NCNC demanded the reinstatement of Blankson - otherwise the party would withdraw its Ministers from the coalition government. Thus, Nigeria was faced with a potential crisis which would have compounded the already grave state of emergency in the country. The Honourable Prime Minister Sir Abubakar Tafawa Balewa who had high respect and a soft spot for Jaja Wachuku pleaded with him to reinstate Blankson and accept another Ministry. Wachuku refused. Balewa even asked his wife Rhoda Idu Jaja Wachuku to plead with him, yet he refused and tendered his resignation from arliament and as an Executive Member of Government mid-day January 14, 1966. Balewa was yet to accept Wachuku's resignation when the army struck by mid-night barely 12 hours later - thus ushering in the era of military coups in Nigeria. Wachuku's official residence, at 7, Okotie-Eboh Street Ikoyi, Lagos, Nigeria was surrounded by soldiers. His younger brother Kennedy Madu Wachuku, father of Ugonna Wachuku was with him that day, Jaja Wachuku looked through the window in the early hours of the morning and asked the soldiers: "What are you boys doing here?" One of the soldiers replied: "Good morning, Sir. But haven't you heard what is happening in the country?" To which Wachuku replied: "Yes. I know you boys have taken over the Government." And the soldiers said: "Do not be afraid, Sir. We have come to protect you for being an honest Government Minister." Jaja Wachuku survived that January 15, 1966 military coup. Jaja Anucha Wachuku retired to his home town, first to Aba and subsequently to Nbawsi, his village when Aba fell during the Nigerian - Biafran war that lasted from July 1967 to January 1970. During the Biafran war, he participated in the legitimate struggle of his Igbo people for freedom and justice against a country that had rejected them by not protecting them from genocide and brutality by its marauding soldiers and citizens. Later, during the war, Wachuku fell out with the Government of Chukwuemeka Odumegwu Ojukwu because the distinguished statesman spoke out against the recruitment of child soldiers. He was arrested and thrown into detention by the Ojukwu Government. And was, at the end of the Biafran war released by a young Nigerian Army Officer called Theophilus Danjuma. The Nigerian soldiers were shocked and dismayed that their first Speaker of the House of Representatives of Nigeria, First Ambassador to the United Nations and First Foreign Affairs Minister was in detention. So, Theophilus Danjuma and his military battalion gave Jaja Wachuku adequate protection and security. Wachuku was escorted home by Nigerian soldiers. And he managed to prevent the looting and destruction of his amazing library located at his country home in Nbawsi Abia State, Nigeria. Wachuku's library was described as the biggest one man library in West Africa by regional and national media. Prime Minister Balewa used to call Jaja Wachuku the most "Bookish Minister." After the Biafran war, Wachuku was involved in Community affairs while practising his law profession. From 1970 to 1978, he served as Chairman of Nbawsi and Umuomainta Town Council, and also Chairman Nsulu Community Council. He was also a Founding Member of the Movement for the creation of Imo State; and Leader, until his death, of the Movement for the creation of Aba State. During Nigeria's second republic - 1979 to 1984, Jaja Wachuku was, on the platform of the Nigerian Peoples Party (NPP), twice (1978 and 1983) elected Senator representing Aba Senatorial Zone of Africa's most populous country. At the Senate of Nigeria, he became NPP Leader and Chairman of the Senate Foreign Relations Committee. During this period, he made various dangerous secret trips to South Africa for meetings with President Pieter Willem Botha to put pressure on him for the dismantling of the obnoxious apartheid system; including the unconditional pardon and release of Nelson Mandela and other political prisoners. It was during this period that, on the floor of the Nigerian Senate, Wachuku made his famous, prophetic statement that the defeat of apartheid in South Africa "shall flow from the barrels of dialogue and contact, not from the barrels of isolation and guns...." He was later removed from the Foreign Relations Committee because of officially calling for dialogue with South Africa: Interestingly, during the 1990 years, when Nigeria started diplomatic relations with South Africa, most prominent politicians and historians in the country called for an apology to Jaja Wachuku. In 1983, he was re-elected to the Nigerian Senate until the Mohammadu Buhari military coup of December, 1983. Jaja Wachuku received many honours; including the title of Ugo Ngwa which was conferred on him by the entire Ngwa People in 1949 but was installed in 1971, Commander of the Order of Niger Republic, Commander of the Order of the Federal Republic of Nigeria [CFR], LL.D: Doctor of Laws Honoris Causa by Trinity College, Dublin, Ireland, Knight of Saint Christopher [KSC] by the Anglican Church Nigeria, Enyi Abia title and Merit Award by the Government of Abia State, Nigeria, etc. Born in 1918, Senator Dr. Jaja Anucha Wachuku was 78 years on his death at the University of Nigeria Teaching Hospital [UNTH] Enugu, Nigeria during the late morning of Thursday, November 7, 1996.